Judith planned the trip today which started with a visit to Coachella Valley Preserve where we hiked 2 miles to an oasis beside the San Andreas fault. There was a large pond in the Oasis surrounded by huge dense palms. We climbed up to 2500 ft and had lunch at Big Morongo Canyon Preserve. Then it was on to the town of Joshua Tree and one of the strangest sculpture gardens anywhere by artist Noah Purfoy. 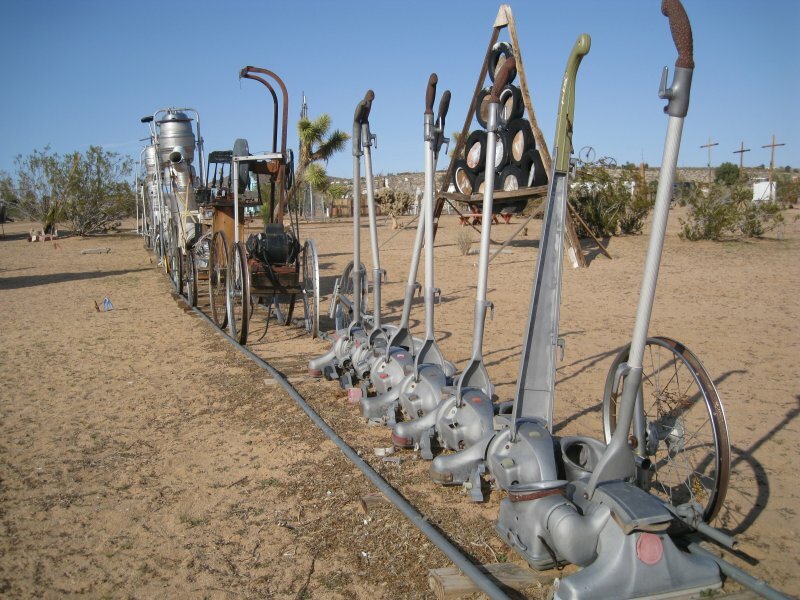 An African American growing up in Alabama he filled his 7 acre lot in the high desert with assemblage sculptures made from various scrapped items. Many pieces have a message based on his life experiences. The artist died in 2004 but a foundation was formed to try and preserve the works as best as possible. More on the web by googling Noah Purfoy. Today's photo shows his "Kirby Express" named after the vacuum cleaners.